To take images from a book and print them as postcards is not often achieved successfully. I've seen far too many postcards and notecards where the publisher has simply shrunk the image from the book to fit on a postcard. The result is very frustrating for colourers, as the details become virtually impossible to colour. Please check carefully if you want to buy postcards, especially those from the top colouring book artists. Enough said! 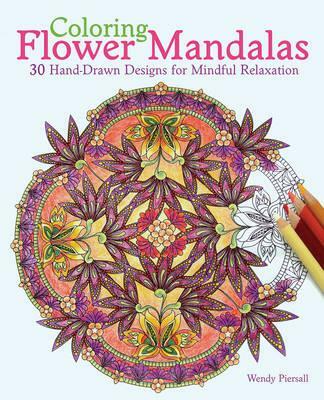 I'm pleased to say that Wendy Piersall took the time to adapt her images from her book, Coloring Flower Mandalas, to fit the smaller format. 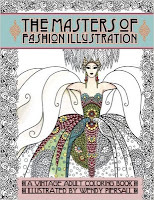 Recently Wendy published a beautiful book, The Masters of Fashion Illustration. You can read my review, see a flip through video and colourings - here. 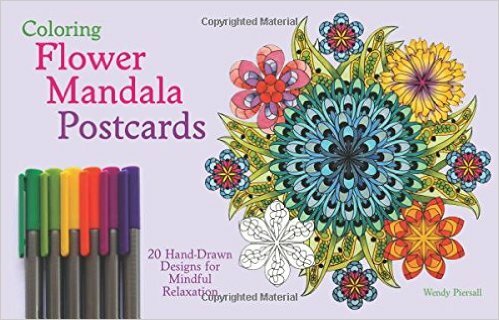 Who will love it - those who like Wendy's drawings, those who enjoy colouring mandalas and flowers in particular, and those who enjoy sharing postcards. 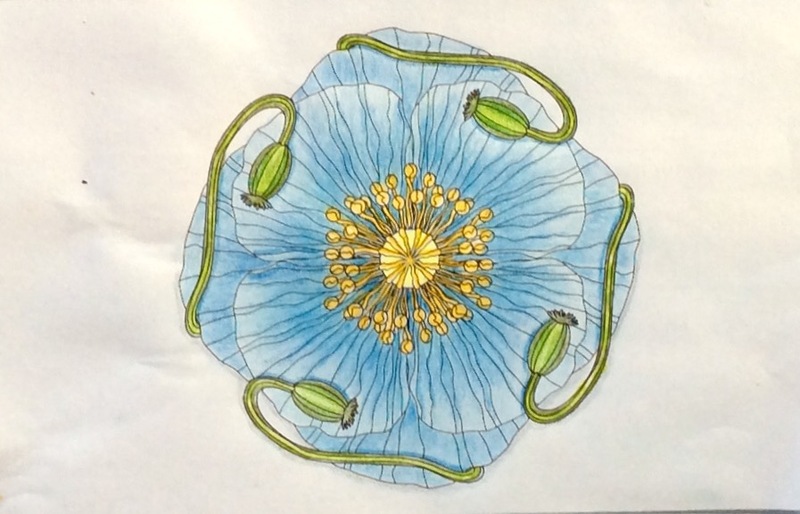 I have wanted to colour this poppy mandala since Wendy's book, Coloring Flower Mandalas, first came out a year ago. To be honest, I preferred colouring it in this smaller postcard size than in the larger book image. Wendy shows a unique style in her themed mandala drawings and her books have been so successful. 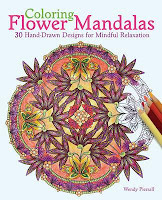 Flowers are an ideal theme for the mandala shape and most of these ones are symmetric in shape. 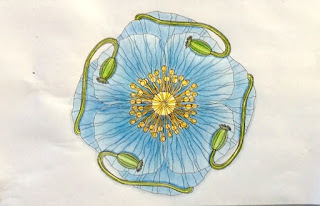 They are detailed but you don't need to fill in each small segment; you can block colour as I did in the poppy, using the fine lines as texture. There is white space surrounding each mandala and you could add a background as you wish. Line width is fine to medium throughout and some mandalas have darker lines than others. It's not easy to take a circular image and apply it to a rectangular card. Wendy didn't want to reduce the detail too much and took the decision to print these images slightly larger than postcard size. It may cost you a bit more to post, but I always put my postcards into envelopes anyway to post them, as I don't want the colouring being damaged in transit. The images are on white card stock with postage layout on the reverse of each one. They are easily detachable. You should test your pens first although there is no spare page for you to do so. Perhaps you could sacrifice your least favourite image as a testing page if you decide to use pens. I was happy to use pencils. Postcards are wonderful for sharing with others. Either colour them yourself to post or send them uncoloured for your friends to colour in. - Colouring Christmas - review & video flip through is here. - In 1795, Paul Drew & Inspired Heidi in 2016 - review & flip through video is here.